Another off-the-beat post, I’m afraid, but sometimes it’s useful to shine a light on the wider workings of journalism and politics–and the symbiosis of the two. Consider the following national newspaper stories. The Daily Mail’s is about an investigation launched last night by Justine Greening, the new International Development Secretary, after a piece appeared in yesterday’s Sunday Telegraph “revealing” that £500m of DFID money goes to consultants every year. And here’s a front page story by me in the Sunday Express on July 1…11 weeks earlier. Andrew’s story, in full here, is pretty much the same as mine here. I’d examined 12 months of accounts (May 2011-April 2012) for the Department for International Development and discovered that consultants had been paid £485m to deliver a chunk of Britain’s £10bn foreign aid budget. I highlighted one company in particular, Adam Smith International, which had received more than £30m in the period and whose four directors had paid themselves £4million in dividends in 2010. There was almost no political reaction to the story and no other newspaper followed it up…until 11 weeks later, of course. I had about 500 words to work with. Andrew’s piece yesterday ran to about 1100 words and he was able to add in more detail and colour. ALMOST half a billion pounds of British aid money was paid to fatcat consultants last year, while thousands more went to civil servants’ luxury hotels, chauffeured cars, and even acting classes. 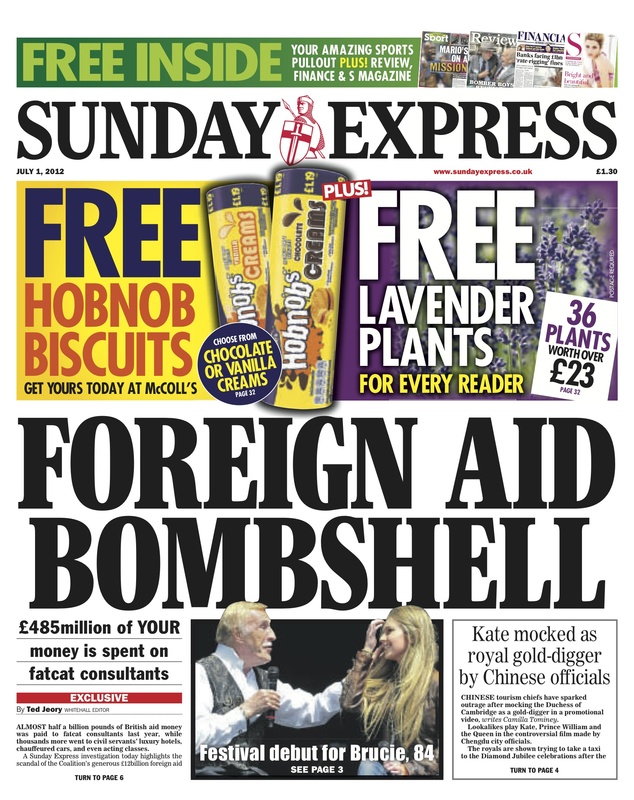 A Sunday Express investigation today highlights the scandal of the Coalition’s generous £12billion foreign aid budget, which is ballooning despite crippling austerity cuts across the rest of Whitehall. Money destined for starving children abroad is either being wasted by civil servants or pocketed by consultants cashing in on the Government’s desire to make Britain an “aid superpower”. Some charge up to £700 an hour, five times the average annual wage in Malawi, Africa. …The biggest beneficiary of Britain’s booming aid industry was free trade consultancy Adam Smith International (ASI). It was paid £30.1million last year to work in countries including Nigeria, Malawi and Pakistan. DfID insists the consultants act as conduits, but ASI’s own accounts reveal that the advice business is also profitable. Four of its directors shared a £4million dividend in 2010. Britain’s swelling overseas aid budget has created a new group of “poverty barons” paying themselves up to £2 million a year for their work helping the disadvantaged. 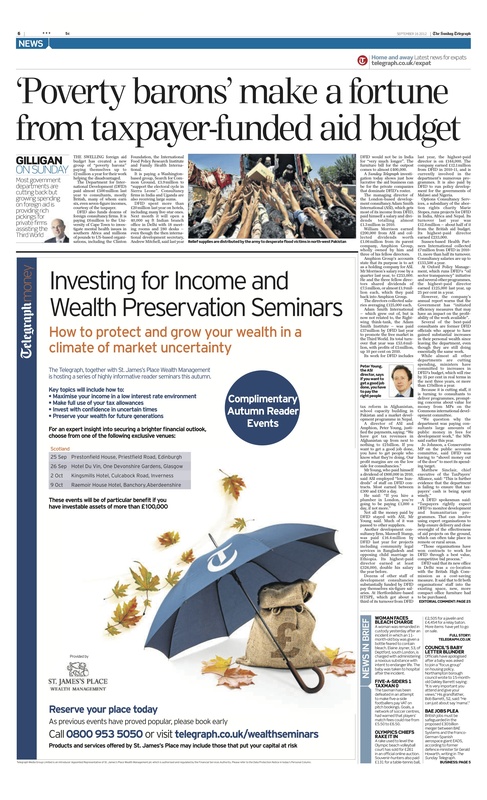 …A Sunday Telegraph investigation shows just how lucrative the aid business can be for the private companies that dominate DFID’s roster. Well, that’s not quite true is it? Those payments had been uncovered by the Sunday Express 11 weeks earlier. But in politics and journalism, so much is about timing. My story came at the beginning of summer and in the weeks leading up to the Olympics when attention was elsewhere. 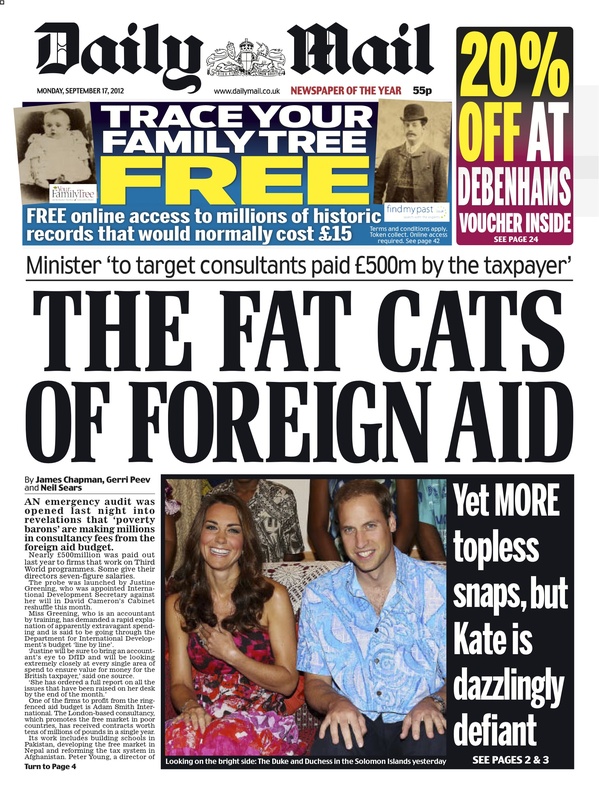 But crucially it also came when the Secretary of State at DFID was Andrew Mitchell, a big fan of foreign aid. The Sunday Telegraph piece couldn’t have been timed better. Justine Greening had just been removed from Transport and dumped into a department she did not want. It is also believed that she is against the ring-fencing of DFID’s budget. So the Telegraph piece was a perfect opportunity for her to set down a marker and make the headlines. Her decision to launch an investigation is for me the most significant aspect of this. When her predecessor Andrew Mitchell read exactly the same revelations in the Sunday Express in July, he did nothing. Change ahead for DFID’s budget in the Autumn Statement….? I recall Gilligan’s Telegraph column using the term “I can reveal” to merely regurgitate information about the “New Bus For London” which had been printed in Buses magazine six weeks earlier. Maybe she will be offered a fatcat job in a consultancy and never be heard of again. It worked with suspicious civil servants, why not her? “International Aid” is of course the best way yet invented of transferring money from poor people in rich countries to rich people in poor countries. This appears to be a variant on that which does not even see the money leave the UK! The journalistic practices you write about happen all the time. Frequently they refer to ‘new evidence’ which Private Eye has been running for months or has already highlighted. On international aid they’ve been running stories about CDC and the profits that have been made by a now-privatised UK govt aid distributor for years (although this might be one step removed from what you wrote about as I’m not sure it counts as a ‘consultancy’). And have a look at the recent findings of the International Development Select Committee on helping develping countries build effective fraud resistanrt tax administrations. I.e. help them build effective tax collection systems rather than throughing cash into a bottomless pit. The point is, surely, that aid has become a profitable business for consultancies. Of course, some profit incentive is needed but some of the profits look abnormal in economic terms, which suggests DFID hasn’t been securing the most efficient deals. Consultancies made a fortune out of public sector contracts in other departments and they are quite possibly doing the same now with DFID. @ eastendersscriptwriterscouldn’t make it up Do you mean ‘The Crown Agents’? I don’t understand your question: were you confused about what I meant by CDC? It is the vehicle for DfID to fund investment in development. Private Eye has been running stories forever about how it privatised itself, the directors (formerly civil servants) made massive profits from the privatisation and how it invests in highly commercial schemes, many of which might easily attract funding from other sources, which maximises returns. While less commercial schemes which need investment and would once have received it from the UK Govt via CDC get sidelined. All in the interests of maximising profits (which the directors of the formerly-public sector body partake in). I’ve never heard of the Crown Agents. The Crown Agents which I assume Graham Taylor is referring to are another fat cat consultancy firm which gains a lot more money from DFID then Adam Smith International. In fact if I remember correctly they are the 2nd biggest beneficiary (awarded £43.2 Million pounds last year), second to Mott Macdonald Group (awarded £54 Million pounds)…. Shocking figures for firms who do very little especially in conflict-prone countries.